Headdesk Alert!Next to him, I pretty much faded into the background. The most interesting thing about my wavy brown hair was how frizzy it was today. 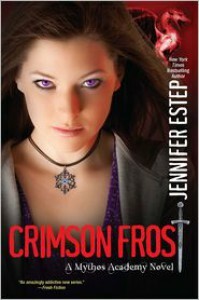 You might look twice at my eyes, which were an unusual shade of violet, but the only thing special about me was the necklace I wore.STOP IT, Jennifer Estep. I'm begging you. We're on book 4 now. Gwen's self-judgment isn't even in the realm of 'oh, it's kind of endearing to see how normal and self-conscious she is' anymore. By now, it's crossed over into the realm of straight-up annoying.Moving on. Now that I got the little vent off my chest, I am ready to proceed with the rest of my happy review.Crimson Frost took the tension up yet another notch. I honestly didn't see how Logan and Gwen's situation was going to keep from going stale, but this story brought it. I can't divulge any big details, but I will congratulate Estep for figuring out how to shake things up without adding a blasted love triangle. Well played, author. Well Played. Between the addition of a new dark, brooding, Russian guardian-type named Alexei (those of you who know of my obsession know that this is an immediate win in my book), as well as the expansion on the "evil" side of the food chain, there were plenty of new people to help handle the adventures this crew got into. The props are getting even better. Not that anything will ever top Vic the talking sword, but I was into the ideas behind the protective gryphon statues and snakes who could inject a venom which worked as a poisonous truth serum. The magic bag of tricks keeps expanding in such a fun way. I love how there's new twists and turns around every corner!The showdown scene at the end was epic. I foresee future books playing to our emotions, but in that torturous kind of way that's actually good because it gets you involved in what's going on. Everything has changed and no one is immune to the fallout. This kind of thing makes me want to stay tuned.I love these characters. Still. I'm seriously vibing on Nickamedes right now. No need to rehash, but when the story and the characters are both working in my favor, I am less likely to complain loudly about the weak areas (the repetitiveness of details is and will probably always be an issue with this author from what I can see). The good more than outweighs even the "headdesk" bad moments (still confused over why so many characters have 'purplish' eyes?). "I know that look. What are you up to, Gwen? ""What makes you think I'm up to something? "The Valkyrie snorted. "You're breathing, aren't you? "I'm happy that this series doesn't seem to take forever between installments because I will be anxiously awaiting book 5!This book was provided from the publisher through Netgalley in exchange for an honest review.